Students will write skip counting patterns and a simple story multiplication problems in which 10 is a factor. Lesson updated 7/24/15. 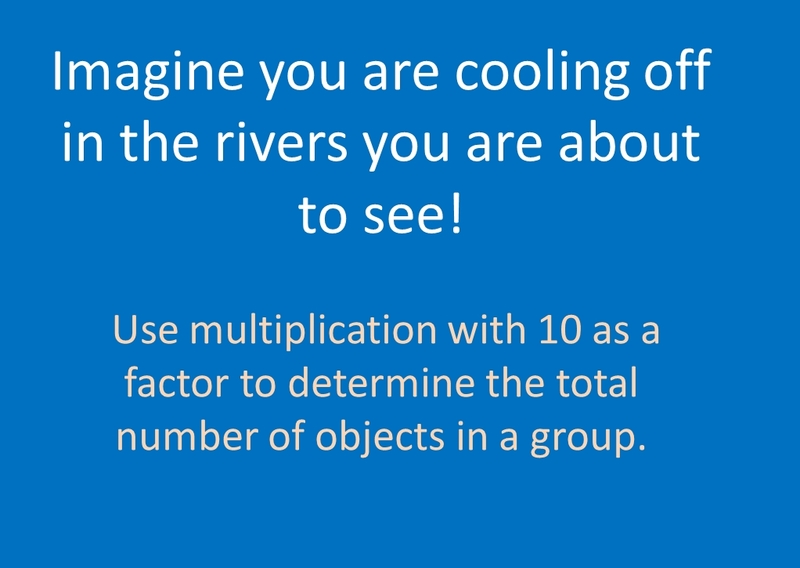 If you know how to count by tens, you can solve multiplication problems in which ten is a factor. I open this lesson by telling students we are working on stories...multiplication stories, that is, in which ten is a factor. Together we count by tens. After that "brain warm up", I call on students to give me the products of the ten facts, out of order. I point out that they don't need to use their fingers, or even count by tens to get to their answer, as multiples of ten have the other factor in their name (except for twenty). Nine - ninety, and so on. Today, students will be counting up using the other factor (two through nine) in the equation and use pictures to help them skip count by these numbers. They can easily check their answer by flipping (commutative) the problem around. 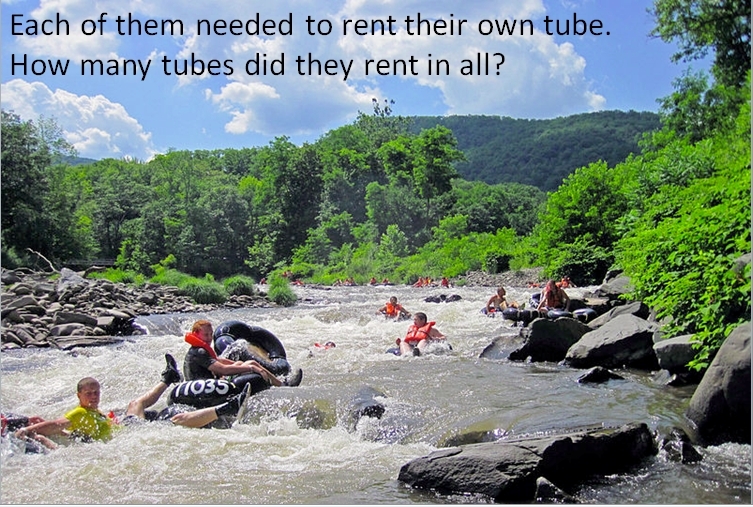 Our adventure into facts with tens begins with some travel, as I show the students Tubing Tens: River Adventure and Basic Multiplication Activity. 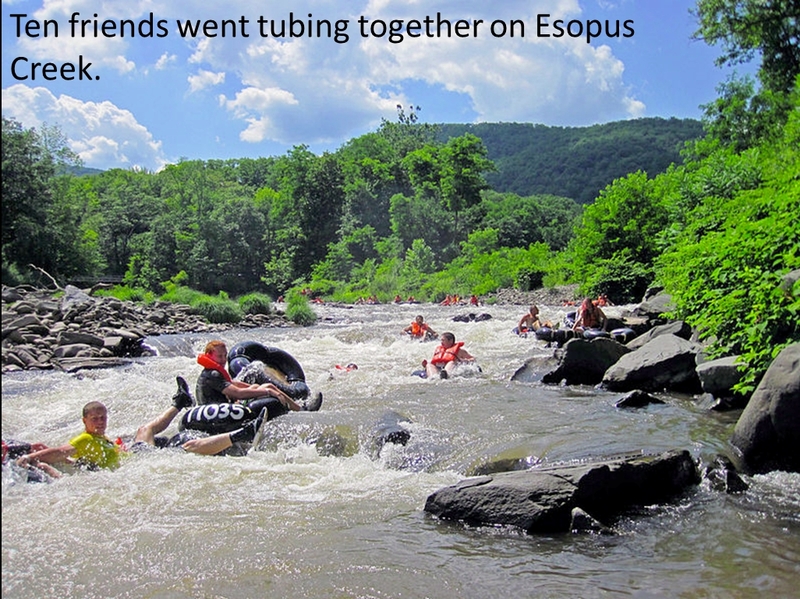 This is a Powerpoint in which people are tubing in different rivers across the United States. For each example, students write the multiplication equation, skip count together, and (optional) write a short story sentence or draw a picture to represent the equation. The students will use this page as a reference when they create their own version of a tubing story tomorrow. If you would like to avoid having students draw out the tubes, the extra support resource here can be used. It eliminates drawing the tubes, but the students are still drawing the objects. Another more heavily scaffolded version has the objects inserted as well. Following our shared river adventure, I bring students back to restate what today's objective was, by having the students tell it to each other. Then, ask them to count by 10's to 100, forwards and backwards. Using their papers, pick a few other numbers to assist them, students next skip count by other numbers (e.g., 3, 4, and 7). This is an important step, and there are many ways throughout the day that students can practice skip counting these numbers that are less frequently taught and practiced. Remind students tomorrow that they will be creating their own Tubing Tens story. For homework, I have students write and solve 3 simple story problem in which ten is a factor.